← Disney Side@Home Party: Food, Fun, and Family & Friends! Her name is Sandy, but I call her a bunch of other names: Mami, Mamuchi, Mimi. Our sweet little girl has all kinds of apodos. How have almost six years passed already since she adopted us?! I remember wishing and hoping and wanting a doggy just like her. I had a checklist of traits: small; light colored; female (since I’m outnumbered in our house! ); fun, but not too hyper; and of course she had to be sweet and good with kids. We got all that and more when our Sandy stumbled into our front yard and she adopted us. Now that she’s getting on in years, it’s important to make sure she remains healthy and active. I also think that with any loved one, whether they walk on two legs or four, it’s important to shower them with lots of amor and spoil them every once in a while. This past week we did just that! 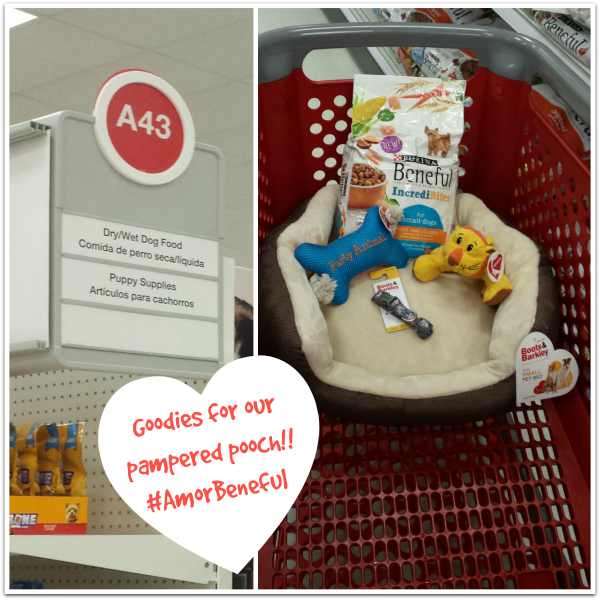 In honor of National Mutt Day on July 31st, I got a few special things for our princess during last weekend’s Target run. I grabbed a bag of Beneful Incredibites, made with real chicken and accented with carrots, sweet potatoes and spinach. The mini bites are perfect for her size, and the protein-rich nutrition is just what she needs as she gets older. Sandy was in the market for a new bed and a new collar, so we picked out a new cozy bed that we just knew she’d love to curl up in, and a really cute collar with flowers in pastel colors. She also got some fun toys too. The boys were with us during this particular Target trip, so they each picked out a toy. Matty chose a squeaky bone that says “Party Animal” because he said he’s going to use it to play toss with her. Brandon recalled that when Matty was a baby and would accidentally drop his cuddly stuffed animal, Sandy would steal hide put it away for safe keeping in her bed. I can’t remember how many times I found that toy in Sandy’s bed during Matty’s infant and toddlerhood. Remembering those days, Brandon picked out a cuddly stuffed lion so she would have her own toy to sleep with at night, in her lovely new bed. That certainly wasn’t the end to her pampering though. She had a grooming appointment early on in the week, and by the time Friday came around, she was thrilled with her new haircut, new bed, new toys, and her new food, too! Sandy has a habit that I find fascinating: when she likes her food she’ll take a few bits of kibble from her bowl and take them back to her bed to snack on for later (ah, that’s right another thing I call her, our ardillita!). It’s so cute to see her do this with Beneful Incredibites. The kibbles are small so a few end up dropping between her bowl and where her bed is, and she comes back and laps them up with her tongue. She also struggles to get those kibble bits when they fall in the crevices of her bed, but she looks so satisfied when she finally finds them and chews them up. I like that Beneful believes in variety, health and flavor for dogs. I’m glad Sandy is enjoying Beneful Incredibites. She definitely thinks Beneful is good, and I know it is good for her. What do you do to make sure your pet is happy and healthy? There will be an Instagram vending machine at these events! And don’t forget to visit the Target in-store demos at various Target locations in the LA area on 8/22/15, 11 am to 4 pm. There will be free samples given out of Incredibites Chicken and flyers with a $2 coupon. You can also check for a Target Coupon in the 8/2/15 newspaper for Beneful (Target locations in LA area only). Learn more about Beneful Incredibites on their Desktop Site or Mobile Site, and check out product availability at Target.com. OMG! HOW ADORABLE! Such a great idea to pamper your pup on this fun day! Great post! Thank you! I had lots of fun buying her all those goodies! Have you had her that long? Holy cow time flies! I know…crazy time needs to slow down! Yes!! A There’s that great Bark Park by your house, I call a doggy playdate!